So, here we are with few research and group conversation on why Facebook.com is a good place to get more direct bookings and a few definite steps which you can follow to generate more direct traffic from Facebook. Priti: Hey Pooja, did you see my pictures of Jodhpur trip?? It was really nice property to spend a romantic vacation. Pooja: Oh! Yes, I saw your Facebook post today morning only, as well as also gone through your instagram posts. Priti: yea, now a day’s people widely use social media for such purposes like finding a good vacation spot or searching for a good property to stay at your preferred location for the vacation. Akshay: Almost 80% of the users log in daily, from 60% of that uses it to look for deals and offers. 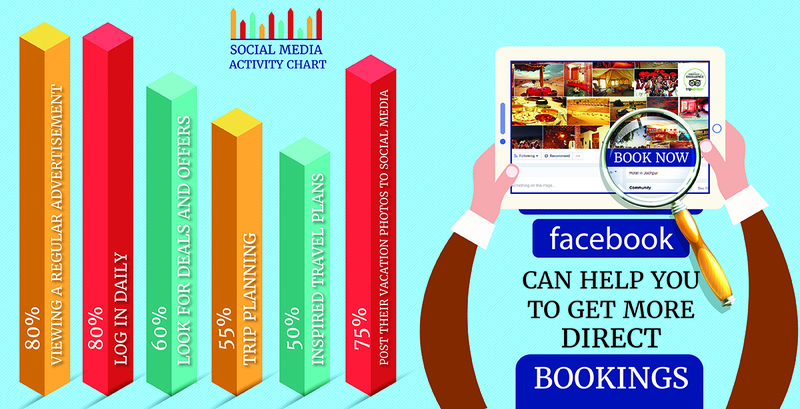 During research, 55% like pages related to the trip they were planning. Priti: True, and during research, more than 50% of the users like the pages related to the trip they were planning. Even I found this resort while going through few facebook posts. Pooja: and 80% of travelers are more likely to make a booking if a friend likes a page rather than viewing a regular advertisement because it’s less time consuming to search reviews of that place. Plus More than 50% of social media users said their friends’ photos inspired their travel plans. Priti: So does it mean you will visit the same resort where I went 😉 ? I must say it was a beautiful property. And now a day’s people post almost everything on Facebook including the place they have visited during the vacation even with the mention of the name of the property they stayed. Pooja: yep!! More than 75% post their vacation photos to social media and even write a short description about their stay at that place, so other people can easily get review from that. Priti: That means social media can actually be the path to increase your online traffic of hotel bookings if you have the right social media strategies. Akshay: Definitely..!! Let me tell you 8 definite points to follow to get more traffic on social media. Priti: Sure, I would love to know that. Akshay: you should share local knowledge and unique stories to your location and use video snippets, images and image collections to tell your story. Priti: Seems true!! People get more attracted to local stories and pictures and videos because it can be more informative to them. Akshay: Connect and reward your followers with exclusive offers & vouchers, because offers and vouchers are the things that attract the crowd the most. Pooja: Another important thing is mouth publicity. Word of mouth is more powerful than ever in a market were people’s attention is on the phone and on social media. Akshay: Make instant booking available, directly into your website; which makes it easier for anyone to do direct online booking, rather than going to other online portals. Priti: Paid online marketing is also a good option right?? Pooja: Paid advertisement on Facebook is much targeted and provides great stats and insights. More then 80 cents of every digital advertising money spent today is allocated to either Facebook or Google. Priti: That was very brief information about social media strategies to increase online booking traffic. We are really doing great on this department.